Fairy Tail Wallpaper: An Eternal Mystery. 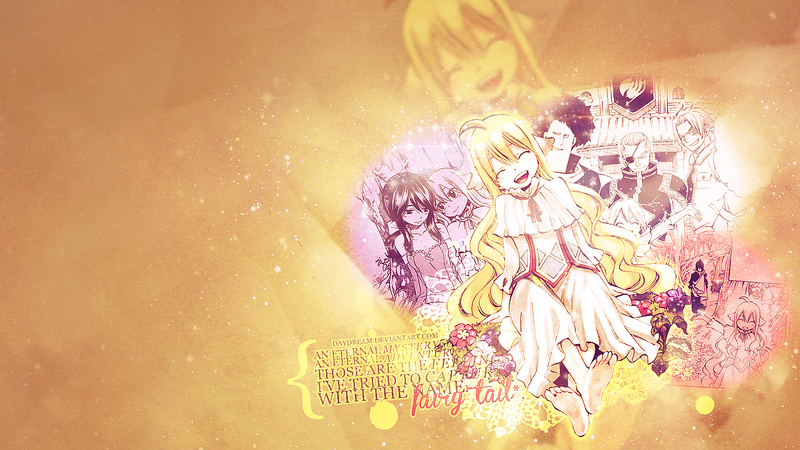 Minitokyo »	Fairy Tail Wallpapers » Fairy Tail Wallpaper: An Eternal Mystery. "Do faeries have tails? In fact, do faeries even exist?" ~ Mavis. Credits: http://mangastream.com/, http://obsidiandawn.com/, http://kabocha.deviantart.com/, http://Evey-V.deviantart.com/, http://WanderingSoul-Stox.deviantart.com/, and http://www.dafont.com/. Cool? Can I ask you how to do it? Quote by shikiginCool? Can I ask you how to do it? 1. First, I got the scan of Mavis, cut her out, resized/moved her to my liking, then used "outer glow" on her for the foreground. Taking the same Mavis cut-out, but not scaled down as much, I used "gaussian blur" on her, set her on "luminosity," and changed the opacity to something lower for the background. 2. As for the manga caps, I got a bunch of different coloured circles, layered the caps over 'em, then selected the circles, and copy/pasted the manga-cap layers to get them to be circular, too. Afterwards, I set the manga layers to "multiply," then rasterized the circles, and blended all of that into the background with the eraser tool set a lower opacity/hardness level. Alternatively, you can use the circle selection tool, increase the feathering level, then copy/paste the manga caps. In the layers menu, you can right-click the layer icon, click "select pixels," create a new layer behind your manga cap layer (which is still set to "mulitply"), then dump whatever colour you want into that.